William Frederick Stevens was the eldest of 7 children of William and Emily Stevens. Although a Gloucestershire boy by birth, the 1911 census record shows that by then the family had settled in Wroughton, Wiltshire and William was a Labourer in the Great Western Railway (GWR) works. William was known in the family as ‘Banker’ but no one knows the origin of this nick name. 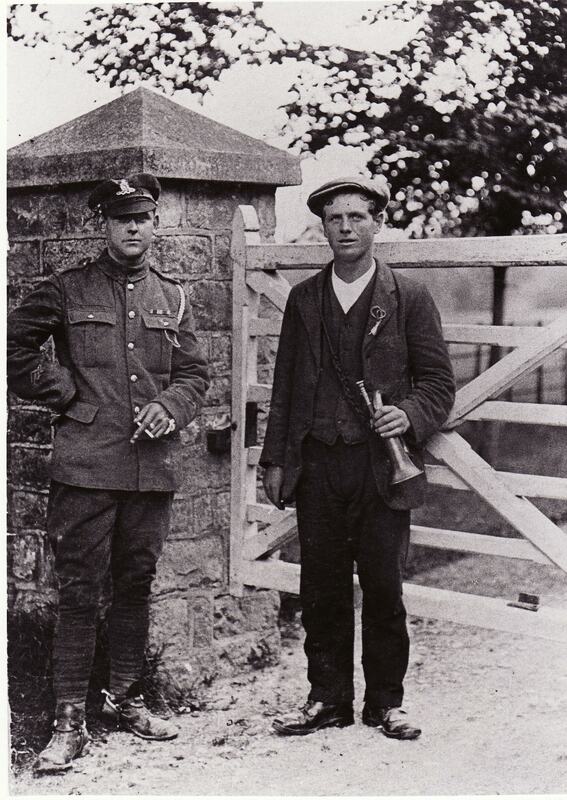 He joined the 1st Battalion of the Wiltshire Regiment, and after a brief period of training was sent to France. Troops ‘on Fatigue’. William is sitting on the right with his arms and feet crossed. Sadly, Private 9120 William Frederick Stephens was injured in the Battle of Mons and lay for hours on the battlefield before he was found and returned to England. He died days later at the Royal Boscombe Hospital. He had a full military funeral that was reported in the Bournemouth Echo of Saturday 24th October 1914 and also in the Swindon Evening Advertiser on Tuesday 27th October 1914. The grim realities of the war are daily being brought home to the people of Bournemouth, and a scene witnessed at Boscombe this morning, when a young soldier who had died from wounds was laid in a soldier’s grave, gave a new and more solemn reminder of the stern meaning of war and of the many such burials happening beyond our ken. 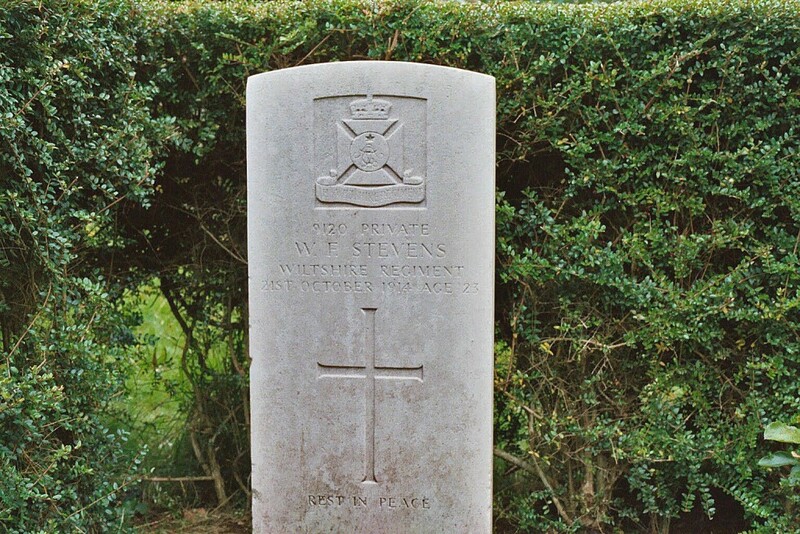 The young hero over whom today the “Last Post” was sounded was Private William F. Stevens of the “C” Company, 1st Wiltshire Regiment, twenty-three years old, whose hip was badly shattered by a shrapnel wound at the Battle of Mons. He lay on the field of battle fifteen hours after being rendered helpless, and this fact, it is believed spoilt any chances he had of recovery, for since his admission to the Boscombe Military Hospital his case had been regarded as a critical, if not a hopeless one, and terminated fatally last Monday. The bereaved parents, who were present at this morning’s solemn ceremony, have two more soldier sons – one in the Wiltshire Regiment now in France, and the third in India. The grief of the parents, great as it obviously was, must have been assuaged by the consoling note of a military funeral and the sympathy of the onlookers. The deceased soldier hails from Wroughton, near Swindon, but it was his humble parents’ wish that he should be buried where he died. A pathetic interest was added by the presence of the long cortege of soldiers of between twenty and thirty of deceased’s wounded comrades. The little band of them – a strange mixture of all kinds of regiments – walked together, and with an emotion known only to themselves and unbetrayed by a firm upper lip, they paid their impressively silent tribute to their dead comrade. One of the heroes peeped over a bandage which almost wholly concealed his face from view: another had the crown of his head swathed in white: while others were either nursing an injured arm or still obviously recovering from injuries to other parts of the body. All wore their khaki coats, most of them battle-stained from the strenuous days of the great retirement from Belgium. Military honours in the midst of this striking and unique setting seemed but an incidental feature of a memorable ceremony. The other soldiers who made up the procession commenced to assemble in the vicinity of the Hospital about eleven o’clock. The units which lined up outside the Hospital and extended in a long double line towards King’s Park, included the “G” and “H” Companies of the 7th Hants Territorials under the command of Capt. Palmer, the 6th Hants Reserve Battery R.F.A., under the command of Capt. Langley Taylor with a firing party and bugle party, also of the 7th Hants. The gun carriage and team which, drawn by six horses, waited outside the Hospital, belonged to the 1st Wessex Royal Engineers Field Company, and was in charge of Corpl. Pratt. The coffin, draped with the Union Jack, was borne from the Hospital to the gun carriage by some dozen of the 7th Hants Reserve Battalion, the bugle and firing party meanwhile standing at attention facing the entrance to the new front of the Hospital. The procession to the Cemetery, via King’s Park, through the main entrance was headed by the 7th Hants Reserve Band under Sergt. Dowding, and was followed by the units named. Behind the gun carriage were cabs containing the mourners, including, first Mr. and Mrs. W. F. Stevens (deceased’s mother and father), who were accompanied by Sister Jones (of the “Empress Victoria” Ward in which the deceased died), and Mr. Gordon Saul, the Secretary to the Royal Victoria and West Hants Hospital. In succeeding cabs were: Surg-Gen Stevenson (officer-in-charge of the sick and wounded at the Hospital). Mr. D.H.W. Robson Burrows (Chairman of the Management Committee of the Royal Victoria and West Hants Hospital), Mr. Godwin Pratt (Hon. Secretary of the Sick and Wounded Committee), the Matron at the Boscombe Hospital (Mrs Samuel Smith), and other officials. The rear of the procession was brought up by other members of the staff of the Hospital, including a considerable number of nurses(?) and lastly the R.A.M.C. ambulance section of the National Reserve, under Sergeant-Major Gurney. Amongst others in the procession were Capt. 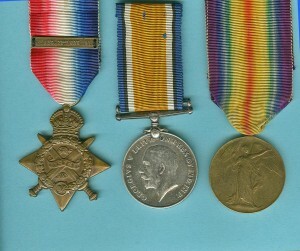 Wingate, representing Col. Godfrey (National Reserve), Sergt-Major Jones (Royal Artillery, Woolwich), and other officers. The journey to the Cemetery was made to the accompaniment of Chopin’s Funeral March and other music. At the church in the burial ground the cortege was met by the Rev. John Hayes, chaplain to the Hospital, and senior curate at St. John’s Boscombe. The scene inside the little church was one to be remembered. The wounded and other soldiers occupied the major portion of it, and the bereaved parents occupied a position next to Sister Jones and the Matron. After the usual service the cortege proceeded to the graveside, where, despite the rain which had fallen almost incessantly, a large crowd had collected. After the committal portions of the service, there followed the firing of the three volleys and the sounding of the “Last Post”. The coffin, of elm with brass fittings, was enclosed in a violet covering, and on a brass inscription plate was the inscription “William Frederick Stevens: died October 19th 1914 aged 23 years”. William is commemorated on the War Memorial in the village of Wroughton, where many members of the extended family still live. 1901 census The 13 year old William is recorded as being a farm labourer in Harpsden, Oxfordshire. 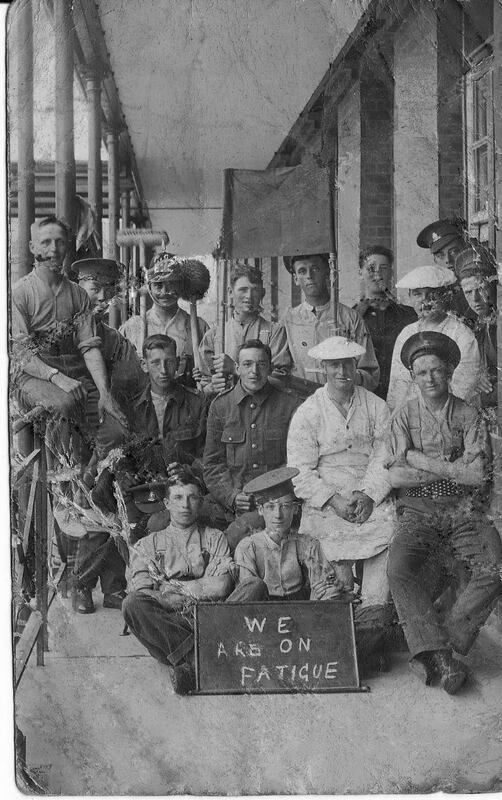 1911 census The Stevens family are recorded as living in Wroughton, Wiltshire and William, like so many other men living in the area, is a Labourer at the GWR works. 19th October 1914 William died, aged just 25, at the Royal Boscombe Hospital, Hampshire, as a result of wounds received on the battlefields of Mons. Two of William’s brothers, George Edward Stevens (known as Ted) and James Albert Stevens (Jim), were also serving at the time of William’s death; Ted in India and Jim in France alongside William. The family story is that Jim was the person who found William injured on the battlefield. A third brother, Moses Stevens, joined up in 1915 and after training in Weymouth he was drafted to France in 1916. Moses had a long career in the Army; he served initially in the Wiltshire Regiment and then in 1917 transferred to the Devonshire Regiment. Whilst with the Devonshire’s he was wounded at Passchendaele and was evacuated to England to recover. Returning to service he was sent to Italy where again he was wounded. 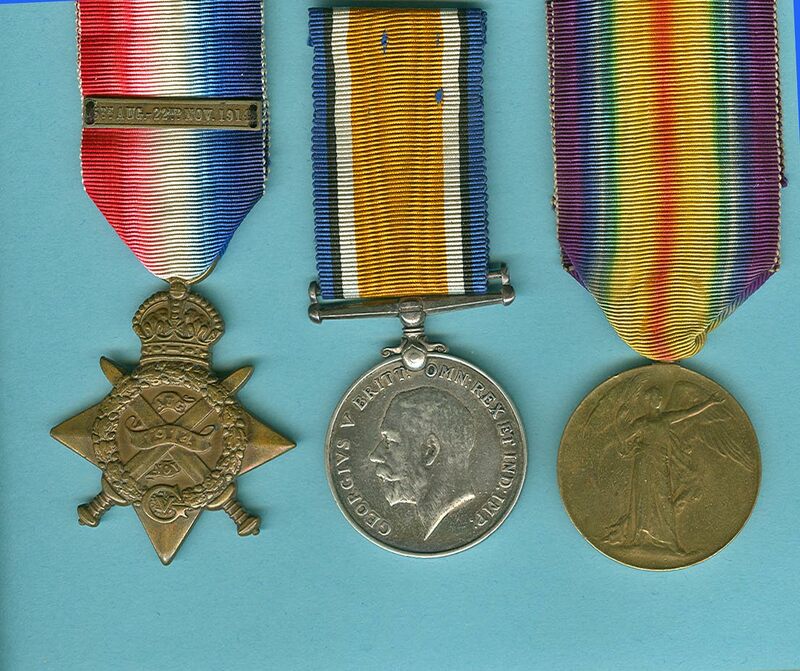 He was discharged in March 1919, but in June 1919 he re-enlisted into the Royal Artillery, and during the next 18 years served in India in the Indian Signal Service and the Royal Corps of Signals, reaching the rank of Sergeant. He was finally discharged in June 1937. Moses married Nellie Maskell in Sept 1925 whilst on leave in England. Nellie and their first child, Harold, joined Moses in India in March 1927. It took 21 days at sea and 3 days and nights by rail. The family travelled across the Desert to Karachi where Moses was stationed. Two of his four children were born in India. Upon discharge from the Army Moses went to work for the Post Office, and when WW2 broke out he joined the 22nd Hampshire (32nd G.P.O.) Home Guard as a Captain.